Busy Bees Patchwork: Things start to Buzz at Busy Bees. Things start to Buzz at Busy Bees. I've been away. Lots too catch up with, so this blog could be a long one. Next Tuesday, September 13th, sees the start of the new programme of workshops and courses at Busy Bees. very near full. Here is a bit of around up of what is going on. Sue kicks of the courses with her very popular 'Quilters Bag' on Tuesday afternoon 1.30 to 3.30. The course is held once a fortnight at Duffryn Community Centre, for six lessons. We had so many people asking Sue to teach this class again it's not surprising that it filled very quickly. Our new quilting group 'Sewing Bee' also has it first meeting on Tuesday evening. The meetings will be held at Duffryn Community Centre from 6pm. This group has been put together for our younger customers. People young enough to talk about their children or career and not grandchildren and/or retirement! If you would like to come along email Louise on sewingbee@busybeespatchwork.com or come along on the evening. You will all be very welcome. The next course off the blocks, on Thursday September 15th, is my eleven lesson course', An Embroidery Sampler Book'. Again I'm really pleased to say that the class is full. I look forward to meeting all the new people on the course. Thursday September 15th also sees the start of Sue's 'Beginners Hand Patchwork Course'. This is another eleven lesson course and is held between 1.30pm to 3.30pm. This class is the perfect course for the beginner, as you learn lots of different patchwork techniques. It would also be a good course for anyone who would like to go over the basics again and to get themselves sewing. This is patchwork for fun. No credits or pressure, just a relaxed way to learn and enjoy this fascinating craft. At the end of the eleven lessons you will have completed a quilt top, like the picture at the top of the page, ready to quilt. If you are interested there are a few places still available. You can book your place by ringing the shop on 01633 810801. Chris Williams 'Bookmaking & Mixed Media Course' is full again and this year. It will be held at Duffryn Community Centre ,so that more people can attend. Sadly the two classes on Saturday September 17th have had to be canceled. 'Doris the sheep', because of lack of numbers. The second class, 'Clematis in Chiffon' with Jennifer Trollope, because Jennifer is still not well. The surgery she had on her shoulder has not been successful. Our thoughts and best wishes are with Jennifer, she has had a very difficult year. We send her our love and hope she is better soon. My new 'Tree Books Course' starts on Thursday September 22nd. I'm really excited about this class and delighted that it is full. 'Brooch Making, Part One' starts on Saturday September 24th. 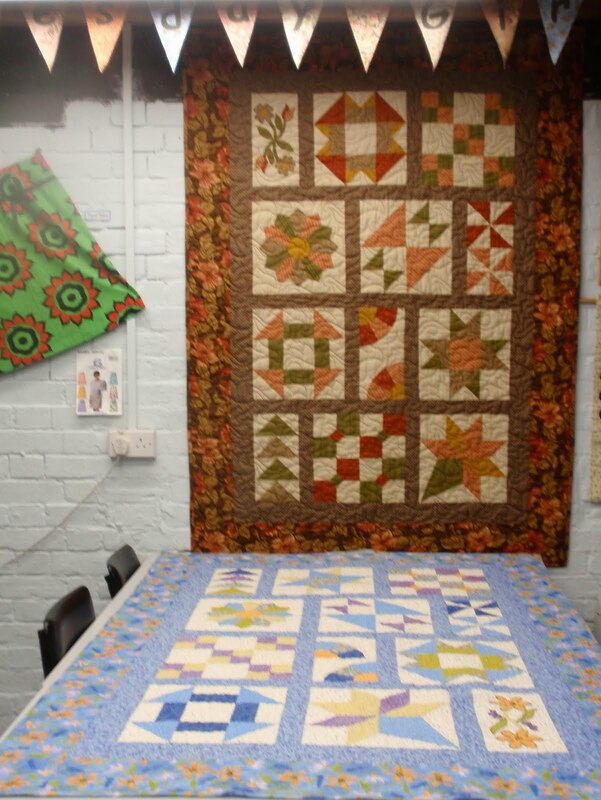 Again this class is full, as is Sally Ablett's class 'Machine Quilting'. The Machine Quilting classes are always very popular, I put Sally in twice. Her next Machine Quilting Class is on Saturday January 28th and there is still places available. Give the shop a ring on 01633 810801 if you would like to come. That's September taken care of. I will let you know how the other classes are doing soon. Remember it is alway worth putting your name down on the waiting list, if a class is full. People book so far in advance that thing change and they have to cancel or if the waiting list is long enough I will always try and arrange the class again on a new date. For those that are interested, ' Now for the Border' with Avril Hann, on the 1st October and 'Make a Simple Skirt' with Elspeth Thomas, on the 8th October, still have a few places free to book. I hope that everyone that comes to the classes enjoy themselves and have lots of fun making and learning at Busy Bees.